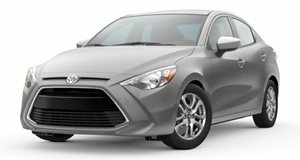 The 2018 Toyota Yaris iA comes equipped with a 1.5-liter four-cylinder engine, outputs are 106hp and 103 lb-ft and either a 6-speed manual or 6-speed automatic transmission can be specified. The iA borrows its underpinnings from the dynamically accomplished Mazda2 and it offers a similarly engaging drive although acceleration figures are leisurely. The iA comes in one comprehensive trim level and offers 16-inch alloys, keyless entry and a 6-speaker audio system with Bluetooth compatibility. Advanced features for this category such as cruise control, 7.0-inch infotainment system, low-speed pre-collision avoidance and reversing camera are also all part of the standard specifications list. The Yaris iA may have up until recently been badged a Scion and its underpinnings borrowed from the Mazda 2 but none of this really matters as the iA is one of the most accomplished subcompact sedans around. It has been under the Toyota banner for two years now and continues into 2018 with minor equipment changes. The Yaris iA’s interior is a pleasant surprise to those more accustomed to the hard plastics and indifferent styling that is common in most cars in this segment. The dashboard and doors are covered in good quality plastics and the centrally mounted touchscreen is easy to use, minor controls and buttons feel sturdy and other than the small cabin dimensions, you might as well be sitting in something another class up. Occupants up front should be able to make themselves comfortable thanks to a range of seating adjustments, the rear is predictably compromised and there is limited leg and headroom available. A decent sized trunk offers good cargo carrying capacity for the class and the folding rear seats extend the carrying capacity even further. Based on the capable Mazda 2 platform, the Yaris iA inherits its capable dynamics. Steering inputs are sharp and the ride remains composed over most surfaces. The iA feels planted and agile along a twisty road, the brakes are capable and there is a decent amount of grip from the standard 16-inch wheels. Highway driving does not show up any weaknesses either, the cabin remains quiet and straight-line stability is good for a car of this size. All things considered, the Yaris iA is one of the more pleasant drives in this segment. The 2018 Toyota Yaris iA is equipped with a 1.5-liter 4-cylinder engine which produces 106 horsepower and 103 lb-ft of torque. Power is sent to the front wheels through either a 6-speed manual or automatic transmission. Acceleration is not of the neck-snapping variety but the Yaris iA feels brisk enough as long as the engine revs are kept high. The 0-60mph time takes a little under 9-seconds which is acceptable for the class but overtaking performance is not as good and a fully-laden Yaris iA will require a lot of road to successfully complete highway passing maneuvers. The automatic transmission does not significantly dampen performance and it offers a sport mode which holds each gear for longer and at the very least increases the perception of speed. The 6-speed automatic shades the manual in the fuel economy stakes achieving a 32/40 city/highway EPA rating, commendable for the class. Standard items include 16-inch alloy wheels, power outside mirrors with LED turn indicators. Daytime running lights. Remote keyless entry, 7-inch touchscreen infotainment display, audio system with 6-speakers and 2 USB ports, steering-wheel satellite controls, Bluetooth compatibility, and a 6-way adjustable driver’s seat. Air-conditioning, cruise control, reversing camera, low-speed pre-collision warning system and a tire-pressure monitor are also included. The automatic transmission also offers a sport mode that is not available on the manual transmission model. Other than a few minor items a center armrest and rear spoiler are the most notable available extras. The subcompact sector is filled with worthy competitors and the Yaris iA’s combination of strengths places it near the top of the class. In particular, the accomplished dynamics and quality interior are well above the class average, it also offers excellent fuel economy and a decent level of standard equipment too. Tight interior space, especially in the rear and unhurried overall performance are its weak points but the Yaris iA still warrants serious consideration if you are in the market for a subcompact sedan.